Like your Dickens by the book? Then this is the version for you! 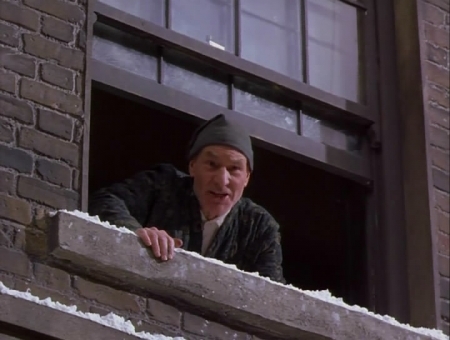 Even more than the Disney this version starring Patrick Stewart from 1999 is incredibly faithful to the source material even including segments never shown in other versions. It was made for TNT (kind of amazing it wasn’t even a network) but it has the look of a PBS film for their Masterpiece Theater series. It is incredibly well cast and all in all I kind of love it. “Oh! But he was a tight-fisted hand at the grindstone, Scrooge! a squeezing, wrenching, grasping, scraping, clutching, covetous, old sinner! Hard and sharp as flint, from which no steel had ever struck out generous fire; secret, and self-contained, and solitary as an oyster. The cold within him froze his old features, nipped his pointed nose, shrivelled his cheek, stiffened his gait; made his eyes red, his thin lips blue; and spoke out shrewdly in his grating voice. A frosty rime was on his head, and on his eyebrows, and his wiry chin. He carried his own low temperature always about with him; he iced his office in the dog-days; and didn’t thaw it one degree at Christmas. 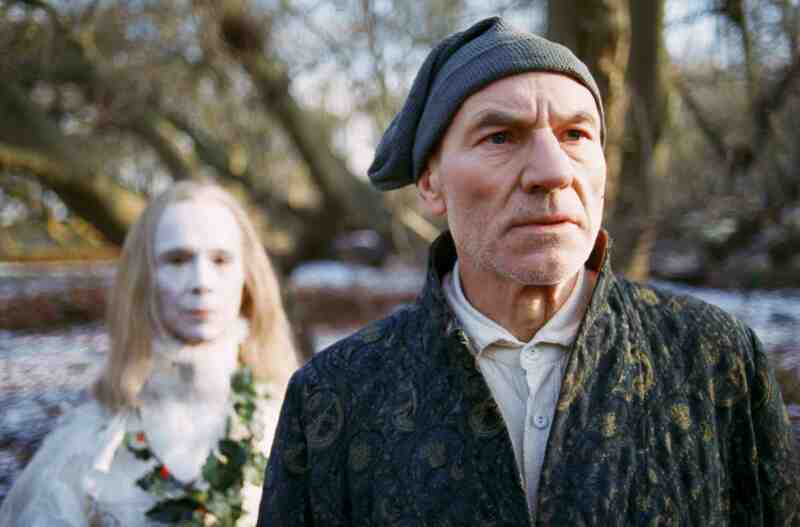 “The Spirit did not tarry here, but bade Scrooge hold his robe, and passing on above the moor, sped—whither? Not to sea? To sea. To Scrooge’s horror, looking back, he saw the last of the land, a frightful range of rocks, behind them; and his ears were deafened by the thundering of water, as it rolled and roared, and raged among the dreadful caverns it had worn, and fiercely tried to undermine the earth. That’s just beautiful and they do it in such a touching way here. Tim starts singing Silent Night and then we see the lighthouse men singing Silent Night, men on a ship, coal miners. I wish I could find a clip because I really love it. Aside from that everything is straight from the book. Strengths- It reminds me in it’s look and feel of the great BBC miniseries North and South (my favorite book), Little Dorrit, Great Expectations and more. The lighting, costumes, sets are a beautiful palate and it’s just a pleasant picture to look at. The cast is uniformly strong with the Cratchit family being one of my favorites of any version. It feels like a poor family (unlike say the Reginald Owens version) but it feels like an actual family. They have chemistry together and there is a great warmth to the scenes. Belle is very pretty. At the party she has a beautiful yellow dress and then when the break up happens we see the change in her and she is no longer in bright clothing. At the party she is dancing in the snow happy and then she says goodbye in a snowstorm and it is just so lovingly shot and acted. Dominic West is very good as Fred and there again is a warmth to him that seems hard to resist. He’s not as perfectly perky as some versions. There is a beautiful moment when Fred and friends are playing their games and Present wants to leave but Scrooge looks at it longingly ‘can we stay another moment. I haven’t played a game in so long’. I found that very real and touching almost like a kid looking in a shop window longing for the great toys inside. It reminds me of the men who dine with Christ not knowing it is Him and they plead with Him to tarry with them a little bit longer. The ending feels like a real religious conversion. And Stewart laughs the way a man would probably laugh at such a moment. Most Crazy Scrooge’s don’t feel natural to the character but this does. Almost more like a sneeze that he can’t help but let out. Scrooge goes to church at the end which I always appreciate because it shows it was not just a conversion to a pleasant holiday but that Scrooge has accepted the proclamation of Tiny Tim and embraced Christ. It’s hard to believe this was a made for cable TV movie in 90s. It looks much better than that. The score by Stephen Warbeck is perfect. One of my favorites. It’s not trying to be a horror movie with over the top slides and scales but just a subtle, simple score punctuated by First Noel and God Rest Ye Merry Gentleman (and Silent Night as I mentioned) at just the right moments. Weaknesses- The Fezziwig scene is not my favorite. 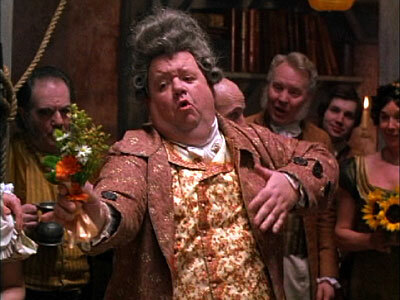 It reminds me more of the Thénardiers in Les Mis than Fezziwigs. They aren’t evil like Thenardiers but just their costumes and boisterousness is overdone. The dancing in the scene is great but just not my favorite Fezziwig’s. A little too foppish. This is after all supposed to be a successful businessman. Past and Future could have been better. Future is your standard grim reaper puppet character and Past by Joel Gray just feels off to me. A little too cold and collected. Maybe even too soft spoken. But all of that are small quibbles in an extremely satisfying picture. Bravo to all involved for creating something truly memorable and that is a favorite of many people. If you want to get a feel for the book without reading it this is the best one by a long shot in that regard. I didn’t like this one all too much. I guess it felt like a TV film, which I guess isn’t bad, but it didn’t make me feel how I wanted to feel. And changing “Fan” to “Fran”?! That bothered me, lol! Sorry you didn’t enjoy it. I think it looks better than most film versions. In fact, most TV nowdays looks as good as movie counterparts. 24 looks as good as most action movies. Downton Abbey as good as most period films etc. But to each his own. It’s so close to the book in every way that the Fan to Fran thing I can overlook. I remember as soon as I heard him say the name ‘Fran’, my mind just went, “Seriously?!”. That’s probably the downside when the Fan scenes are the scenes you look forward to most in an ‘A Christmas Carol’ adaptation. Fair enough but aside from the name the scene is good. The love and grief on Stewart’s face when he see’s his little sister felt so real. Maybe later in the month I will feel differently but just thought I would let you know so you didn’t think I ignored your request. Lol ok, are you gonna do the Tim Curry version at least? I usually find the relationship between Scrooge and Fred the most interesting, it is kind of a shame that it is either missing or not particularly well realized in most adaptations. That’s one of the reasons why I like the 1984 version so much…it not only explains why Fred keeps inviting a guy who keeps insulting him to his celebration (not because his uncle is rich but to honour his mother), but also hints why scrooge is so cold to him (because he reminds him of Fan). Cool. I agree. It is a touching pilgrimage of sorts he makes in honor of his mother and I think he is genuinely hopeful it will do some good. I think in the book he says something about even if it just helps Cratchit a bit it is worth it. I know, I sound like a complainer, but that is one of those I didn’t enjoy at all. It was kind of doomed from the get go, because I simply didn’t buy Patrick Steward in the role. 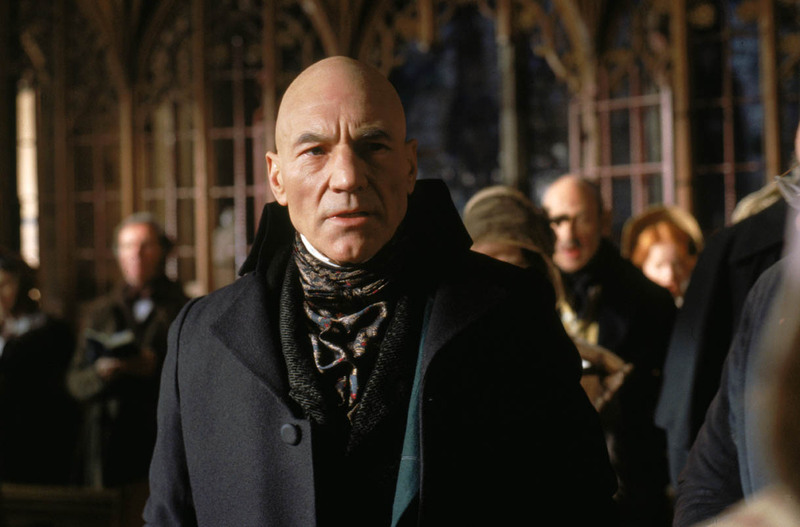 When I see him, I see “gentleman”, and in all those gentleman roles, he is perfect, but I didn’t buy the grumpy scrooge at all from him. Plus, the production looks kind of cheap…I know, it’s a TV production, but still. I mean, they tried. But I gave up on it halfway though. It was different enough to hold my interest (sometimes sticking to the book can be a disadvantage), and not put together well enough to make me want watching until the end. Fair enough. I actually thought it had some of the more impressive cinematography and direction I’ve seen and I totally bought Stewart as Scrooge. 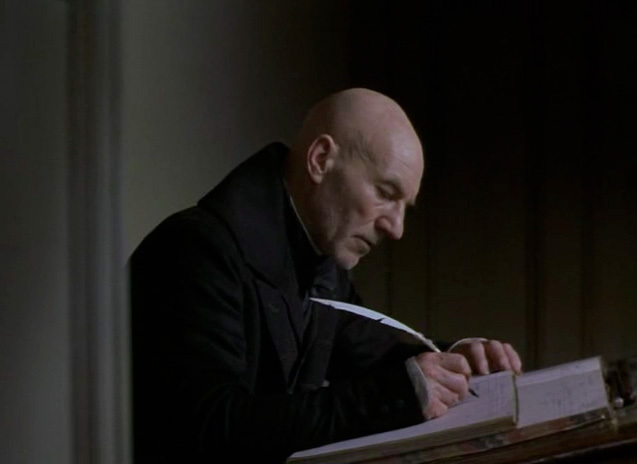 To me he is actually what I imagine him looking like when I read. I always appreciate alternative points of view so thanks again. 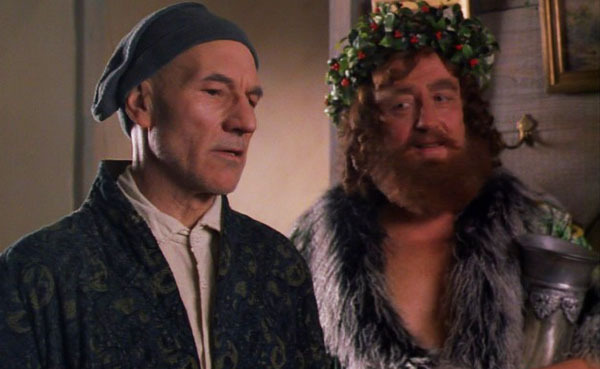 I always felt that Dickens looked at the conversion of Paul in the Bible as his example for Scrooge. Starting out as Saul he killed believers, stoned an apostle, but he saw the vision and changed his life and even his name to Paul. So the closer a version gets to that kind of conversion the more I like it, when we are dealing with traditional adaptations at least. Did you make it through the lighthouse and the Silent Night sequence? I just loved it so much. I wonder why every version skips that segment? I think Scrooge is a combination of all the people Dickens encountered when he fought against the poverty. In the end, A Christmas Charol is a political pamphlet disguised as a Christian story in order to convince people that it was high time to act. You could say that about all of Dickens books . They all had an activism to them especially against the Yorkshire Schools. He was not exactly subtle in Nicholas Nickleby, Bleak House, Little Dorrit or Oliver Twist of his positions on social issues. Christmas Carol was slightly different than his other books because it was not serialized and he desperately needed a hit. It was an odd combination of passion project and commercial endeavor. He had spoken at an event for his sister in Manchester and it had made him ponder the idea of a man obsessed with money. I actually think he toned down the political discourse because he needed the hit so badly. But he was a Christian man as can be seen in The Life of Our Lord which he wrote for his family. So I don’t think he was disguising the story. I think he genuinely wanted to tell a story about the redemptive power of Christ and he used Christmas as the framework to make that story more approachable. In a way it is especially interesting that he used Christmas when other holidays were more popular that were giving charitable times. He went out of his way to pick a holiday with Christ in its very title. The success of the book practically created the current Christmas we know. It was a much simpler affair then but the day was known to people as a day to celebrate Christ and attend church. Scrooge was not just denying a social, charitable time but he was denying the grace of Christ in his life. This is very clear in the text when Tim, Scrooge’s foil, speaks of hoping people will think of Christ when they see him. Scrooge is immediately impressed. Earlier in the story he has tried to demonize the Christians for being closed on Sunday’s but the true message of Christ touches him and he is never quite the same after that moment hearing Tim’s words. In a biography I read it said he was fascinated with stories of conversion and faith like Joan of Arc and so I don’t see why Paul would not have been a heavy influence. Anyway, whatever his motives may have been that’s just the versions that move me the most and what I get out of the novel each Christmas. But I hope you enjoy the reviews regardless whether you agree with my interpretation or not. This is my favorite version. It’s the closest in tone and feel to the book. 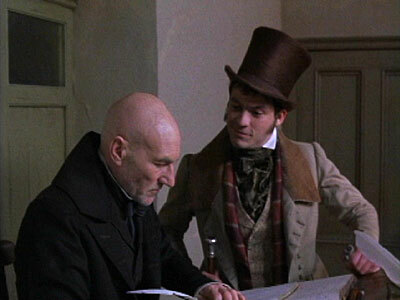 Patrick Stewart is the Scrooge that’s in my mind now forever, I think, and Dominic West is Fred as I now always imagine him. Me too! I’m so glad someone agrees with me . Thanks for commenting. 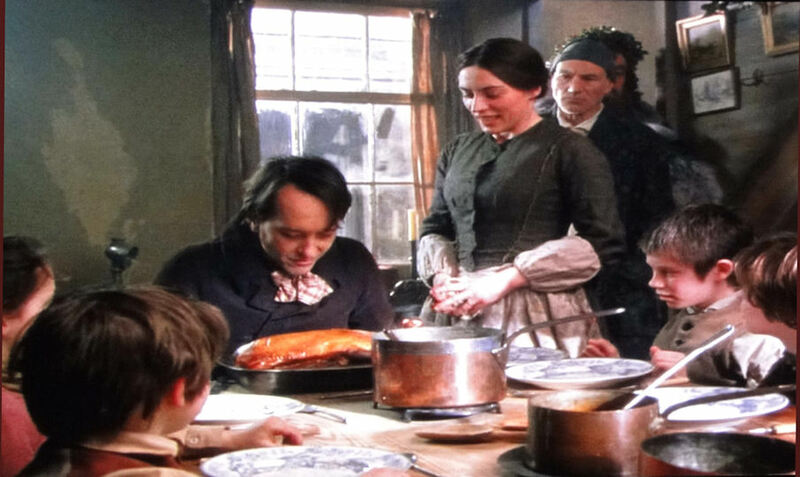 It is just as I saw it for both those characters and I LOVE the Cratchit’s in this movie. They feel like a real family. I really like the cinematography, dancing, music etc. Isn’t that Silent Night scene wonderful? I liked it even more this go around than I had before. Yes, the soundtrack – I forgot how much that adds to the feel of it. I think I watch this film every year. And I try to read the book every year too (though I don’t always have the time too). More than anything though, it’s that opening five minutes or so where the atmosphere is so strongly evoked. It’s so great because it doesn’t try to be a horror movie soundtrack. Even though it is a ghost story I find that rarely works for me. I like the way it takes traditional carols and traditional sounding melodies but gives them a darker edge when needed. Unless you are Jaws or the theme from the Exorcist horror music scores tend to become dated very quickly. I’m not sure why but this feels timeless. Oh and I agree on the first 5 minutes. It feels less like a play and more like people actually talking. There is an older man in my acquaintance who is a Scrooge type character and this gets the feeling of how talking to him can feel. He’s extremely judgmental and has a kind of disdainful of others and their flaws and it makes you want to keep your distance. This version captures that horrible boss feeling and he excuses it like many would today saying ‘you were just being a businessman.’ I’ve always been fascinated by stories about work (why we work, what is too much ambition look like, love and work, a life’s meaning through their work etc). 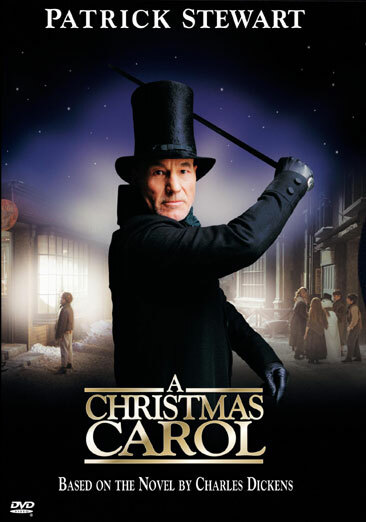 It might not seem so at first but Christmas Carol covers all of those issues and of course much more. Anyway, great film. It reminds me a little of the recent 2011 version of Jane Eyre in some of the choices they made. I really enjoyed watching it. This movie does almost everything right: the casting, the portrayal of the story, and the atmosphere. 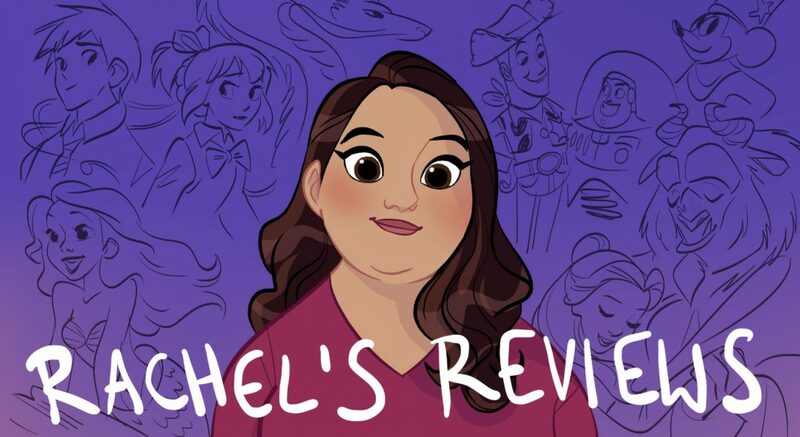 It doesn’t feel at all forced or awkward like some other adaptations which are particularly faithful to the source material; it flows perfectly in the visual medium. I agree with most of the points you raise about the film. The bit at the end where Scrooge laughs for the first time in years and initially sounds like he’s choking is great. I especially like the Silent Night sequence, not just because of how it works in the film, but because of how it makes me feel about Christmas in general. It reminds me to appreciate the spirit of the holiday and the simple joy of celebrating with family and friends. The scene with the Cratchits has a similar effect. I personally don’t mind Christmas Past (who never seems to be exactly the same in any adaptation) or the Fezziwig scene, though maybe that’s because I recognise Mrs Fezziwig from Doctor Who. There is something a little off about Christmas Future, though: it looks a bit too ragged and flimsy. I really love Dickens’s description of Scrooge that you’ve posted a few times now, by the way. It’s one of the best initial character descriptions ever. I totally agree on everything you said and I know I’ve posted the description several times but like you said it’s such a perfect description that when I try to explain why I like or do not like a particular version I end up just feeling like ‘well, let Dickens explain it’ because he does it so perfectly. I don’t mind a softer version of Scrooge but it is not canon and it is not how I would go if I was directing a movie. I think it lessens the intensity at the end when he is that softer side. I guess maybe I will hold off on repeating the description again but I just keep feeling compelled to include it. I like what you said about the ending because so rarely in any medium are characters allowed to cry or laugh for that matter the way we actually do. I love the end of the 1995 Sense and Sensibility for this same reason. Emma Thompson cries an ugly cry. The kind you really would cry in that situation where you can hardly breathe. Stewart captures that feeling in that moment. It makes me wonder why other versions don’t include The Silent Night scene. I guess it is just too expensive to mount but even in animated versions they don’t include it and it is so meaningful. I agree. Really focuses on the true meaning of Christmas. And it all comes down to chemistry. A cast of a movie or TV Show can feel at home together, comfortable and we as viewers sense that, especially in a story that is trying to teach us something. Pingback: My Top 10 Christmas Carol Films | Reviewing All 54 Disney Animated Films And More!